Bandung city has been known as the Paris Van Java city, which is one of favorite tourist destinations in Indonesia. Many travelers come to visit this city to enjoy its fresh air, tasty local cuisines, and to hunt for branded fashion goods at an affordable price. Yet, not many travelers have known about a place called Stone Garden, which is located in Masigit village, about 30-45 minutes drive from the Bandung city. It can be understood since this place is only started to be open to visitors in 2015. Prior to 2015, the place is only known as a stone mining area. Due to the archeological finding of the historical values of the stones in this area, the government prohibits stone mining in this area. Those who were previously worked as a stone (rock) miners gathered together to find alternative jobs or business for the continuity of their family income. Given the fact of the stones historical value and the beautiful surroundings of the area, these former stone miners formed a local community organization to manage this area to become the new tourist destination in West Java. They also came up with the idea to name this destination as the Stone Garden Geo-Park. As per its name, the park is a relic of Earth history that aged around 27 years old. It is about 700 meters above the sea level. 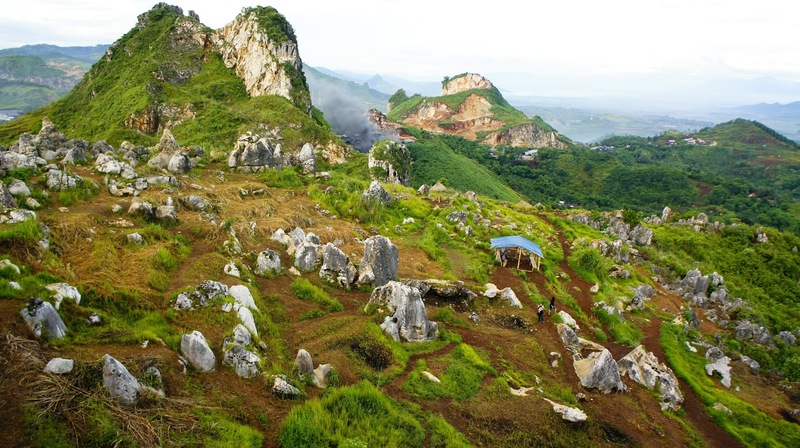 Stone Garden, which is about 5 kilometers from the Padallarang exit toll, presents the artistic karst stones in various types which are surrounded by the wonderful mountain scenery. Archeologists, who found the fossils of ancient animals and humans in this area, stated that this area was an ancient ocean which evolved to become the rock mountain. Moreover, a lot of the stones are in a kind of hollow rocks just like a sponge with large cavities which strengthens the argument. Coming to Stone Garden will make you feel as if you were in ancient time, the Stone Era. Some travelers even defined this exotic place like Christmas Island in Australia. Due to the marvelous scenery of this place, many travelers visit this place for their pre-wedding photo sessions. Some others will choose to do one-night camping in this area to enjoy thousands of stars in the sky during the night with limited lights. Moreover, some companies have come to use this place as the setting for their commercial advertisings. International travelers may choose to book a flight to Bandung or Jakarta. Either from Bandung or Jakarta, travelers will go to Stone Garden toward Padalarang exit toll. From this exit toll, they will need to continue driving to reach Cipatat and Gunung Masigit village. It is not yet advisable to take a public bus (transportation). The best alternative is to rent a car with a driver. Due to the road infrastructure from the main road to this area, travelers may consider bringing kind of semi off-road car. In addition, bringing a bottle of water, hat, sunscreen, snacks are also advisable for this trip. Moreover, travelers may also need to bring wet tissue and dry tissue for their business at the toilet as no tissue facilities provided. It is also advisable for them to wear sneaker for the trip convenience unless you want to do a pre-wedding photo session, which is worth to explore, in this area. In case you have any questions and assistances to design your traveling plan, please feel free to contact me. Happy traveling... ! Tourist attractions Weh Island is a tourist attraction in Aceh which unknown to many tourists, especially tourists in the country. However, for those lovers of sea travel, Weh Island is a well known tourist spot because it is one of the diving and surfing. Iboih Beach, that is located in Weh Island, is a beach frequented by those who want to dive. You can enjoy the beauty beneath the sea in Weh Island, including along the traces of nature are separates the island of Sabang of the island of Sumatra. Due to the strong sea waves, Weh Island also be exciting surfing spot in Aceh. Dive spots in Weh Island eg Marine Park on the island of Rubiah. Here you will find an amazing variety of marine animals, including sharks, whales, dolphins, turtles, and manta rays. Weh Island Tourism has beautiful coral reefs. One of the interesting places in Aceh is located on the western side of the map Indonesia. Weh Island is located in the path of the entrance to the Strait of Malacca, thus not surprisingly you will find quite a lot of cruise ships or yachts passing in the sea area of Weh Island. Of course, this is a pretty good view while down and enjoy sightseeing in Sabang Weh island. Enjoy a tour of Weh Island will take you on a fun beach life. You can choose lodgings, from the most simple to the luxurious. There is a wooden hut that you can rent at a very cheap cost, also there is even bungalows costly if that is what you want. There are many guesthouses for travel enthusiasts who arrived in Weh Island. You can enjoy a swing bed nets tied between coconut trees while enjoying panoramic views of the beach and surrounding life. If you take a right on the beach, you might be surprised just how crystal clear sea water is located on the island. Moonlight reflections at nightfall will increasingly add to the exotic sights in Weh Island. A highly efficient travel experience! But, I do not know what causes why people are still not many came to Aceh to enjoy sightseeing in this Weh Island. The most logical reason is the lack of information that expose the beauty of sea travel and an interesting variety of water activities in the Weh Island. As a result, the Indonesian public still do not know one of the many attractions in Aceh. However, Weh Island travel trends are increasing with the development of infrastructure and local government efforts there. It's an exciting thing of course. Visit Sabang means you have set foot in the Zero Kilometer of Indonesia. There, standing monument signifying this. This monument is named as Monument "Zero Kilometer of Indonesia" . To explore Sabang and the beach there, actually most favor by walking, taxis are also available if you need. Minibus already exist, motorcycles and even a three-wheeled rickshaws are also available to take you exploring the island of Sabang. You can also rent a car. Exploring the island of Weh will take you to places of interest in Sabang like waterfalls, volcanoes, hot water, bunkers Japan in World War II, the historic cemetery, sacred Durian, and the town of Sabang. Characteristic of souvenirs from this area is creative products made from coconut wood. Maybe you want to buy as a souvenir, or to give to your friends, family, or couples. You can visit the traditional markets to get fresh fruits and snacks. There dodol (sweets made from a particular flour, sugar, palm sugar and sometimes fruit), chips, cookies, and bread (typical of this island) that you can buy. If you are from Banda Aceh, then you can use the ferry in the morning in the port of Ulee Lheue and will arrive at the beach Gapang. Using the ferry will take a few hours, it is different if use the speedboat which takes about 45 minutes. If you are from Medan, of course you have to go to Banda Aceh in advance, can take a bus or plane. Tidung Island in Jakarta has the beauty of marine tourism that you should try. Tidung has clear sea water with coral rocks colorful. In tourist areas Tidung, you also can see a view of the mangrove forest. Tidung is one of the islands of the Kepulauan Seribu Islands, has been transformed into a tourist destination in Jakarta that attracts many residents of the capital to spend their weekends with the family. Tidung has a quiet atmosphere, as favored by the atmosphere of Tidung is shady beaches and calm sea. In Tidung, many tourists relax in the gazebo or under a shady tree, also sunbathe, to see the sunrise, or enjoy water games such as Banana Bout, Water Spot, Cano, Sea Goose, Jetsky. Tidung island is divided into two parts, namely Big Tidung and Small Tidung. 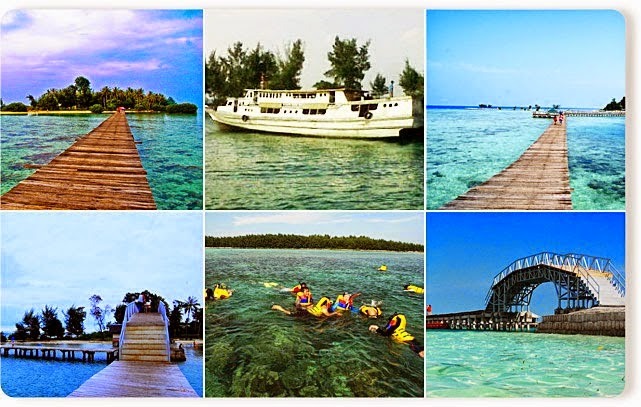 Big Tidung Island is an attractive tourist destination in Jakarta that consist by many beaches should you to visit. While Small Tidung Island is an uninhabited area, just overgrown with mangrove forests that are managed directly by the local government to maintain the balance of nature. To get Tidung, you can depart from the port in Marina Ancol. From here, you will travel for 1 hour by speedboat to get Tidung Island. In addition to the departure point Tidung you can also start from the port in Muara Angke. From Angke, you will take time for 2.5 hours to get the Tidung Island. Besides Banana Boat, Water Spot, Cano, Sea Goose, Jetsky, you can do snorkeling and diving in the tourist area of this Tidung Island. There is a place what rent many snorkel equipment that you can go. One of the unique in Tidung is the Bridge of Love. Actually, the love bridge is a bridge that connects Big Tidung and Small Tidung. Enjoy a walk along this bridge is an interesting experience. You can watch the enchanting sea panorama with blue sea water, beautiful coral reefs, up to watch the sunset. There is a popular activity carried out at the Bridge of Love, namely Jump Tidung. You can jump / plunge into the sea from the bridge which has 6 m high. As usual the weather in the tourist area of the island / marine, the sun is something you feel normal. Therefore, the best way to keep your body cool during enjoy sightseeing in Tidung is to use clothing with cotton material that absorbs sweat, and select brightly colored clothes to avoid the absorption of sunlight that much. Tidung Island has many homestay and accommodation. There is facing directly into the sea, and equipped with facilities other extras. To be sure, a family tourist activities in Tidung Island is one of the things that you should try, especially if you are a citizen of Jakarta. 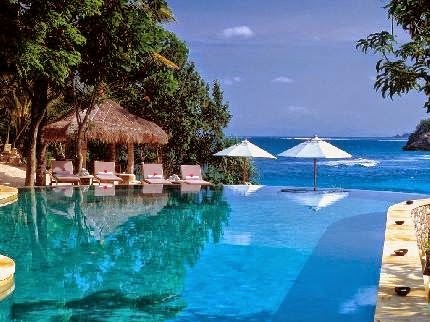 Klungkung, district located in the eastern part of the island of Bali is the administrative owner of Nusa Lembongan. Nusa Lembongan island communities, to have a profession livelihood as farmers seaweed, as an employee of the hotel, as fishing and trade. Lembongan Island has so many unspoiled natural beauty so there will be many interesting places that you can visit during Lembongan island. Existing tourist attractions such as natural caves and sea cliffs. Not only on the island of Bali, Lembongan island also has many famous beaches like is Dream Beach and Sunset Beach and coastal seaweed center named beach Lebaoh. Just as in the other tourist attractions of Bali, the island also has a hotel for your stay, To go to the island of Lembongan, you can use the services of Bali Cruise, such as Nusa Lembongan Transfer Bounty Cruise Bali and Bali Hai Cruise. Both the cruise Bali provider, offers vacation packages to Lembongan island. Currently tourists are having to travel to Lembongan trend by purchasing a package Bali Cruise. In addition to providing cruise to Lembongan island, in the cruise package also provided a wide range of watersport activities such as snorkeling Bali, Banana Boat Rides, Flying Fish, Diving, Jet Ski. So it can be said, this island is the best place for tours such as diving, snorkeling, surfing, fishing and island trekking. If you want to get around on the island of Lembongan, to enjoy the rustic feel, you can use a motorcycle that you can rent. In this area many motorcycle rental service provider that you can rent at a price of Rp 50 thousand for 6 hours. Cars are still very limited in this island, you will very rarely see a private car. During the tour at Lembongan tourist area, you will see the quiet and cozy atmosphere, the houses of citizens who live in this area is still very simple. If you like small island tour, the island of Gili Trawangan Lombok one of the islands that you should visit. Currently the island of Gili Trawangan really enjoy doing by tourists while they vacation in Bali. Ease of access from island to island of Gili Trawangan Lombok, make tourists always took a vacation to Gili Trawangan while on holiday in Bali. See how beautiful Gili Trawangan, Click here! Gili Gili fast boat is the best way to go to Gili Trawangan from Bali. Currently many service providers Gili Gili fast boat on the island of Bali. Using a fast boat, the travel time from the port of Padang Bai to Gili Trawangan only takes 1.5 hours. One provider of Gili Gili fast boat from Bali to Gili Gili Trawangan is "Wahana Gili Ocean", the company is one of the best-selling in Bali, because the price offered is still in the affordable category. 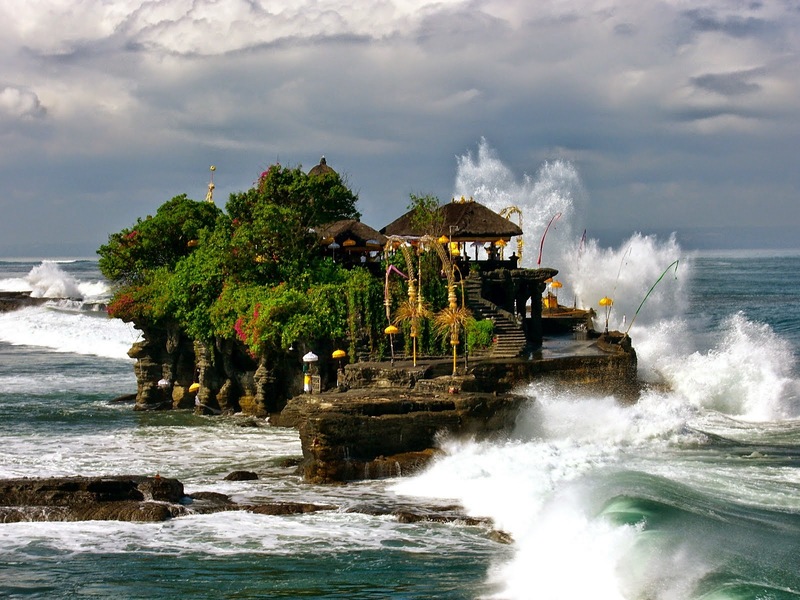 Interesting sights in Bali than Kuta and Ubud which is worth a visit is "Tanah Lot". Tanah Lot tourist attraction located not so far from the attractions of Kuta and Sanur. About an hour's drive from Kuta or one and a half hour from the village of Ubud Gianyar. Routes to the beach location very easily traversed by bus or private car. If you ask where is the famous beaches in Bali, one of which is this beach. Location Tanah Lot beach in the village of Braban, Tabanan. The village is a coastal managers provide wide parking area. From the parking area visitors must pass through the path to get to the beach location. The admission price for adults for local tourists is Rp 10.000 per person, while children Rp 7.500 per person. Just as in other favorite tourist attraction, admission to foreign tourists also differ. Foreign tourists Tickets for adults Rp 30,000 per person, and children Rp 15,000 per person. Entrance tickets opened at 7:00 to 19:00. A temple stands majestically on a rock on the beach. In accordance with the place, the temple is named the temple of Tanah Lot. A holy place for Hindu people of Bali are very guarded sacredness, not everyone who comes allowed into the temple area. Only those who have a goal to pray, permitted entry and must use a scarf. If it was high tide, to get to the temple area, must ride the boat, because the seawater exceeds 2 meters compared to about 0.5 meters at low tide. Towards the afternoon tourists began to arrive. Sinking sun went beautify the atmosphere. You will not be in vain to take the time from Kuta or Nusa Dua heading to the Tanah Lot beach. Twilight is so impressive charm with Kecak dance performances enliven the atmosphere that adds to the beauty of the Tanah Lot beach. Only by paying Rp 50.000 for all ages, you can see dance around 17:30 pm. Dancers numbering more than 20 people and most of the men. In the spirit, the dancers shout "cak ... cak ... cak ..." broke the silence. Along the road to the beach, available shops selling souvenirs typical of Bali. If you feel thirsty and hungry you can buy coconut ice, snacks, which are available at food stalls around the Tanah Lot beach. The price is almost the same as a tourist attraction in Bali others. Lodging facilities are available ranging than budget to five-star grade. The closer to the beach then the price is more expensive. Tabanan regency government is very concerned potentials. Evidenced by the access roads have been repaired, there is always a call to maintain the cleanliness, safety and comfort. Do not forget to taste the original culinary Tabanan namely klepon cake made of glutinous rice contains brown sugar and grated coconut in it. 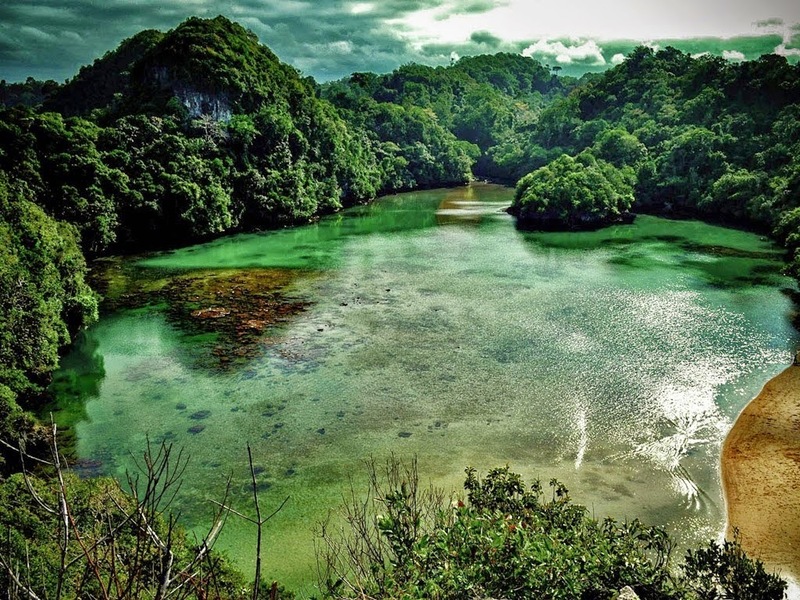 Sempu Island Tourism in Malang is one of the natural attractions worth visiting. 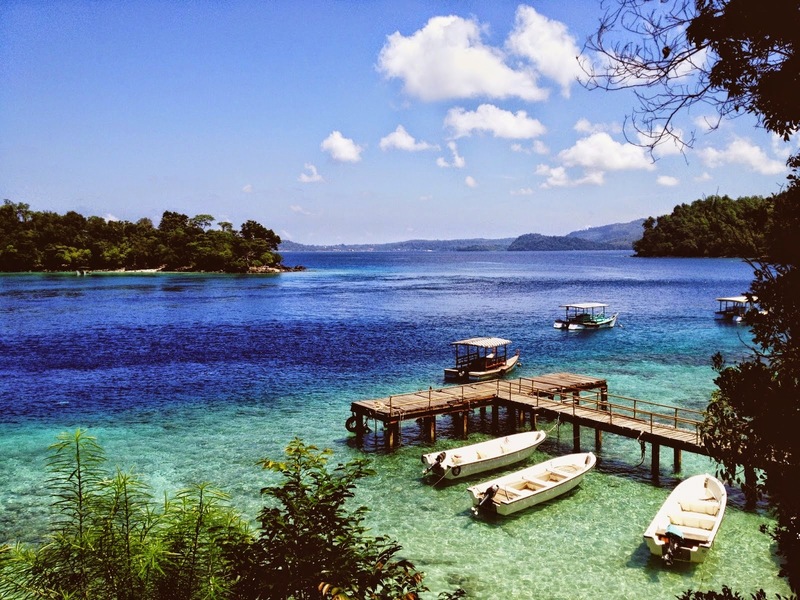 Sempu island has a compelling main attraction, "Segara Anakan". A beach on the island with white sand and has an area of 4 ha. The water in the lagoon is derived from sea water which separated by rocks. Sempu Island tourist area is predominantly covered by tropical trees covering an area of 877 ha, this is a nature reserve which directly managed by the Natural Resources Conservation Center East Java (BBKSDA) and the Ministry of Forestry of Indonesia. With enjoy sightseeing in Sempu Island, you will get to experience a memorable adventure in the heart. Visiting the lagoon on the island of Sempu, then pitched a tent for the night on the banks of the lagoon will present an intimate atmosphere in the middle of a dense tropical forest. Swimming in the lagoon and play at the edges is an interesting activity that is not overlooked. Tourist attractions in Sempu Island administratively is part of the Village Pond Rejo Village, Sumbermanjing Wetan, Malang. To get Sempu Island, you have to arrive first at Sendang Biru Beach, Malang. From Sendang Biru beach, you can hire a boat that will take you to arrive in the tourist area of Sempu Island. Travel to the island Sempu not as easy as you might think. It is a natural adventure that you must pass in order to get there, especially if you want to get Segara Anakan. From Sendang Biru Beach, you have to cross a strait. Furthermore, when you have arrived at Teluk Semut in Sempu Island, then you have to go on for 2 hours roam the dense forest, the path is steep, until finally arriving at the lagoon. Has provided trekking to help you arrive. No hotel or guesthouse accommodation even in the tourist area of this Sempu Island. It is a tropical forest filled with dense trees. Instead of camping on the island of Sempu is an interesting thing. Camped on the outskirts of the lagoon, relax, play and swim, and enjoy the panorama around is a small part of some exciting activities on the natural place. You like to get intimate private atmosphere in the midst of nature. If you have arrived on the island of Sempu, you can visit some interesting places in Sempu Island, including Waru-waru Beach, Telaga Lele (Catfish Wells) , Gua Macan (Tiger Cave), Pasir Panjang Beach, Pasir Kembar Beach and Fresh Water Beach. They will be presenting to you a nature adventure so memorable. If you want to camp, make sure the availability of logistics, food and beverage, has been fulfilled. When in Sendang Biru Beach, make sure it is not forgotten. Also, you must enroll in post nature reserve in Sendang Biru Beach to obtain a camping permit. However, prior to entering the tourist area Sempu Island, you have to have special permission to enter because Sempu island is a conservation area. That is, one of the tourist attractions in Malang, is a protected area. You can obtain this permission to come to the office BBKSDA East Java (Surabaya), or the office of Capital Ownership KSDA Region III (Jember), or also office Region Conservation Section VI (Probolinggo). 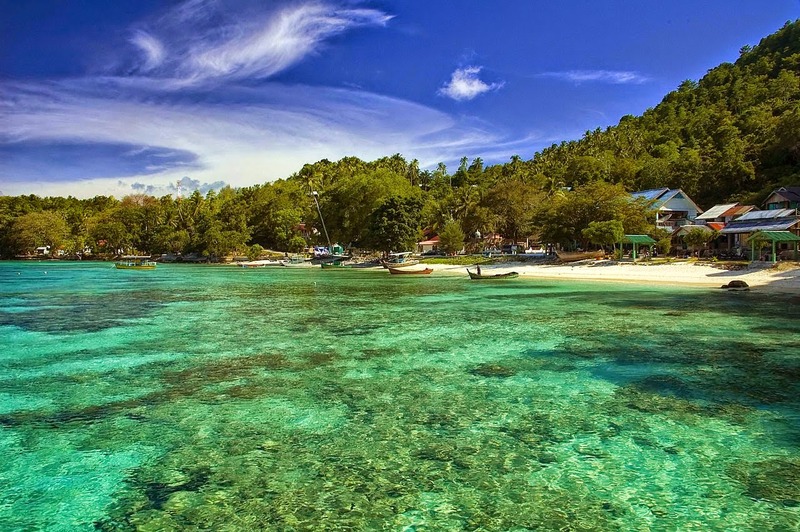 With this permit, then you can take a trip to the tourist attractions of Sempu Island. Sempu Island tourist area is located approximately 80 km from the city of Malang. If from Surabaya, is about 180 miles and spent 3 hours. If you have arrived in the city of Malang, it takes 3 hours in order to arrive in Sendang Biru Beach. From this beach you will hire a boat that will take you to Teluk Semut in the Sempu Island. Boat rental fees in Sempu Island is Rp 100 thousand per person. You can ask the clerk at the post directly on a nature reserve in Sendang Biru Beach if you want to get information about Sempu Island. Have you visited the waterfalls when on holiday to Bali? Or maybe you do not know if there is waterfalls in Bali? Indeed, there are many tourists who knows if there are waterfalls in Bali. At most tourists only know Gitgit Waterfall is located not so far from the tourist area of Bedugul. Not many people know the existence of other waterfalls. Though Bali has many beautiful waterfalls scattered in various corners of the island. If we counted the numbers there are dozens. Most of waterfalls are located in the region of North Bali (Buleleng). With a hilly region and many mountains, making Buleleng has many waterfalls. However, waterfalls in Bali not only in Buleleng. There is also waterfalls in the other districts. Here are eight of the most beautiful waterfalls in Bali are worth your visit when on holiday to Bali. The seventh waterfalls lying scattered in various corners of Bali. Do not forget, prepare stamina when will visit various waterfalls following, because you will pass fairly challenging terrain and had to go up and down stairs. Sekumpul Waterfall touted as the most beautiful waterfall in Bali. It is located quite close to Lemukih Waterfall, approximately only 2 km. Understandably, Sekumpul village and the neighboring village of Lemukih indeed. To see Sekumpul Waterfall, it takes a bit of effort and struggle. From the parking area, you have to walk quite far away, down a road that ground, down hundreds of steps, and across the river. If you ride a motorcycle, you can still ride from the parking area (near the ticket booth), until at the end of the road paving. Once finished paving, road turned into a narrow dirt road (footpath). Not long down the path, you came at a gazebo with views of Sekumpul Waterfall outstanding. From the gazebo, Sekumpul Waterfall looks very beautiful in the distance. Which makes this waterfall is different from most of the waterfall, Sekumpul Waterfall not only consist of one or two waterfalls. There are at least seven waterfalls are located separate and apart, that you can see from the gazebo. Seven waterfalls are scattered in the high cliffs and surrounded by green trees soothing eye. Seventh waterfall has a shape and different heights. Truly amazing. Not one indeed, if Sekumpul Waterfall crowned as the most beautiful waterfall in Bali. Of the seven waterfalls in Sekumpul Waterfall, only two waterfalls that you can go closer. Interestingly, two waterfalls are located side by side have different heights and water discharge. Two waterfall is derived from two different springs. Waterfall on the left comes from the spring while a waterfall on the right (higher) derived from the river. In the rainy season, the waterfall on the left remains clear while the waterfall on the right will be a murky brown. For approaching Sekumpul Waterfall, you have to descend hundreds of steps are steep in some places and crossed the river. We recommend you wear shorts and sandals are comfortable when visiting Sekumpul Waterfall because you have to cross the river to get in front of the waterfall. It takes a bit of effort to reach this beautiful waterfall. However, my struggle paid off when I got close to the waterfall is 80 meters high. Splashing sound of water falling and splashing water splashing create an atmosphere of calm and reassuring. Shady trees around the waterfall makes the atmosphere more cool and beautiful. Anyone will surely fall in love with Sekumpul Waterfall. We encourage you to visit Sekumpul Waterfall after visiting Lemukih, because Sekumpul Waterfall distance is only about 2 miles from Lemukih Waterfall. From Lemukih Waterfall continue your journey to the village of Sekumpul. After seeing the signpost to Waterfall on the right road, turn left as far as 1 mile and arrived at the parking lot Sekumpul Waterfall. Furthermore, you are a short walk to reach the waterfall. Copyright © 2010 Cherris Blogger Traveler All Rights Reserved.